Two Rock Mountain has a pre-historic cairn known as "Fairy Castle" marking it's summit. 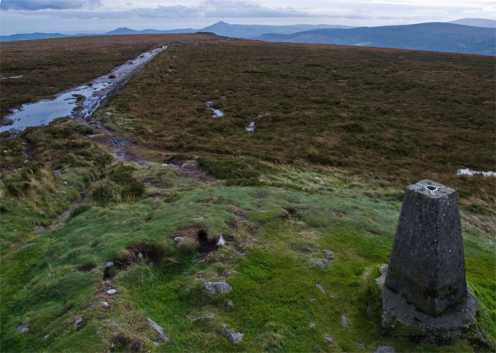 There are panoramic views from the top which include Mullacleevaun, Tonlegee, the Sugarloaf , Cooleys and Mournes as well as interesting views of Dublin City and the East Coast. It's a focal point for for many walks including "Sunday afternoon strolls" and longer walks which might incorporate parts of the Wicklow Way (From Marlay Park to Cloneygal in Carlow) or the newer Dublin Mountains Way( From Tallaght to Shankhill). The development work for these trails has helped to contain the significant erosion at the top. It's an easily accessible mountain, some of the more popular routes would be from Tibraddan Car Park (O1380 2284 A) or Glencullen (O1910 2060 B), using the DMW. From Marlay Park or Kilmashogue Car Park (O1520 2440 C) using the Wicklow Way. From the East side, starting at the Blue Light Pub (O1809 2413 D) and walking via Three Rock Mountain or, starting at Kilgobbin Cemetary (O1891 2438 E), for a longer walk using the old mass path from Barnacullia to Sandyford Church .. see track 800.